iPhone 6 is currently the most popular device in the apple line up. As a hot summer deal ,we at repairxpert are very excited to present the offer to all our customers and beyond. iPhone 6 cracked screen replacement will only cost $100. This price will cover both front screen digitizer and lcd. For all iPhone repairs, we generally replace the complete front screen assembly that consists of both Touch Digitizer and LCD. 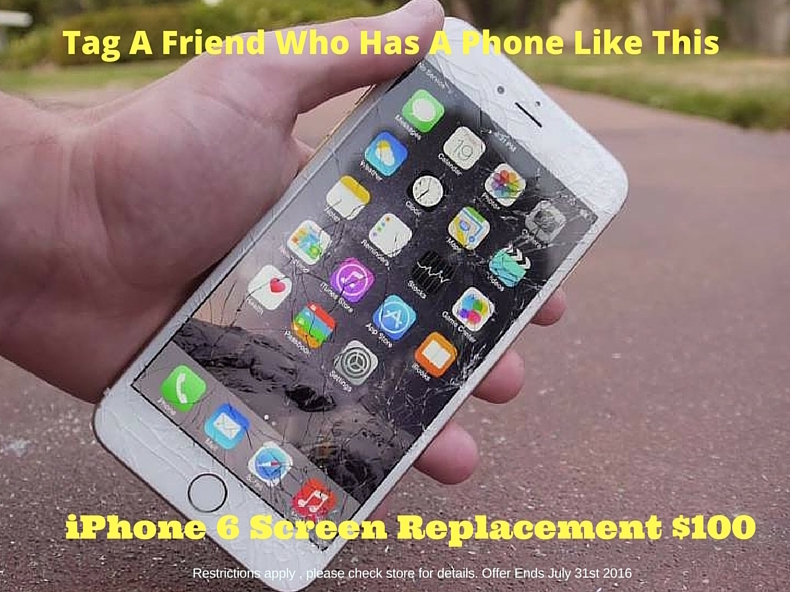 To take advantage of this offer, one has to make an online appointment here http://www.repairxpert.com/GetYourAppointment and then take in the device for repair. Price before sales tax. Repair price might go up based on device condition. Additional cost might apply based on device condition. All repairs will carry 90 days Repairxpert Warranty. No two offers can be combined, Restrictions apply, Check store for additional details. Welcome to the future! The everyday use of computers has now found its way into the palm of our hand in the form of Smartphone & tablet devices. Nowadays, you can do almost everything on these handy devices, which, a few years back, where proprietary only to computers. But, let’s not abandon our computers so quickly! Even today, many of us still rely on our PC 's and Mac’s to get the bulk of our daily work accomplished. There will always be a home for them! We aim to fix your PC/ Mac’s at the best possible price, providing high-quality service in a timely manner. We strictly use new and high-quality parts to repair your devices and offer a 90 day Warranty. We service homes, schools & cooperate users with anything from broken screens, display malfunctions, hard drive crashes, charging issue, virus infections, network problems to data recovery, and many things in between. Place your appointment according to a date and time convenient for you. Visit the RepairXpert and drop off your device for the repair on your selected day. Our Team of Xpert's will accept your device and begin the "FREE DIAGNOSIS". Oh yes, you read that correct! That's F R E E !! Once our technician completes his examination, you will receive an email or phone-call with the estimated cost to fix your device along with a complete diagnosis report. Transparency is very important and we show that in our process. Most repairs are done on the same day. So what you are you waiting for? No need to waste your precious time by thinking twice. Just bring your PC or Mac to the nearest RepairXpert location & get it fixed right away! Visit RepairXpert.com to schedule your Appointment! You can also Email us at pc@repairxpert.com or Call: (914) 481-4111. WE ARE YOUR ONE-STOP-SHOP SOLUTION FOR ALL COMPUTER REPAIRS AND SERVICES. How to Fix the Proximity Sensor in iPhone 5c/5/5s? Well, it would be quite useless to ask if you know about proximity sensor of your phone or not. Of course, you do! Proximity sensor is a sensor that is installed in your iPhone to detect the objects close to the screen. The sensor gets enabled or sleeps when you’re making a call or when the phone is near your ear. Steve Jobs already explained the importance of the proximity sensor with the launch of iPhone in 2007. It is helpful in saving battery when you have a long conversation over the phone. Proximity sensor in one of the important features in an iPhone as when the phone is attached to the ear whilebeing on call, the sensor automatically senses it and locks the screen so that none of the other icon is being touched. Let’s talk about the fact, what if suddenly the proximity sensor stops working? It can create issues, the call might get on speaker or may be mute, and it can be disconnected or can make another call. You need to keep in mind that the proximity sensor can be fixed. Before fixing the sensor, backup your iPhone as there’s a probability that some of the data might be lost so it’s better to play safe. Technically, there are two methods for fixing the sensor. Make sure you’ve cleaned the display screen of your phone. If you face any issues with the cleaning process, it can be because of the protector on the screen. Power off the phone by pressing the lock button and then restart it after a few seconds. Erase all the content and reset the settings by: Settings>> General >> Reset >> Reset all Content & Settings. Keep the iPhone in recovery mode or DFU mode. o For Recovery Mode: Plug in the phone with your PC or MAC Book, try to launch iTunes. Hold the power and home button until the phone restarts and the Apple logo appears. The moment Apple logo appears, wait for the iTunes sign and cable display on the screen. Select Restore, and let iTunes download firmware that is required for factory reset settings. o For DFU mode: Plug in the phone with your PC or MAC Book, try to launch iTunes. Hold the power and home button until the phone restarts. Wait for 5-7 seconds, leave the power button but keep pressing the home button. If it succeeds, choose Restore, and let iTunes download firmware for factory reset settings. If you’ve tried the DIY method but it didn’t fix the sensor, your sensor might need to be replaced or transferred. When you open up the screen of your iPhone, you’ll get to notice that there is a framed-shape item in your phone that is known as proximity sensor holder. The issue with proximity sensor occurs, usually when the holder is misplaced, it should be kept in place to make the proximity sensor work. Red tape is used to keep the holder in place. There is a shape where the holder should be place, it should be aligned with the shape. Wi-Fi calling feature is an amazing feature that enables you to make the voice calls using Wi-Fi. Wi-Fi calling is accessible for the users of iPhone 5c, 5s as well as iPhone 6 users can also use this feature. If you are facing problem during making calls over Wi-Fi, here are some tips for you that can help you to fix the problem. You can follow the five tips to fix the problem on your iPhone and we are hoping that it will be helpful for you to fix the problem. If you have faced any problem with the connectivity of Wi-Fi previously, then this solution will be helpful for you to fix the problem. First of all open Settings, turn off the Wi-Fi, after that turn it on again. Generally, Wi-Fi calling works fine after doing this. If you are having problems with the Wi-Fi calling on your phone, then you should need to restart the Wi-Fi router. Sometimes, the simple step is the most helpful thing to solve the problem. If the Wi-Fi calling isn’t working fine after trying the above tips, then restart your phone. To power off your phone, press the power button and hold it for few seconds and a slider will appear on the screen, drag the slider to turn off the phone. After switching your phone off, press the power button once again to turn on your phone. After turning it on, Try making a call and hopefully the problem will be fixed. In case, if your phone isn’t working properly, you need to force restart your phone. It is also easy. Press the home and power button together and hold the buttons for few seconds and then let go the buttons after the apple logo appears. Click on the Reset Network Settings. If we take a look on the Wi-Fi calling feature, users of iPhone are completely satisfied with this feature it is a great feature, but we know that, problems may arise sometimes, in such case, you will find these five tips very helpful for you. Try the above five tips one by one and any of the tips will be helpful for you to fix the problem. Motorola Moto X was released in August 2013 and insanely took the markets. Moto X combines an array of remarkable features and made its users highly satisfied. With the positive feedback received by the Moto X users, it is no doubt that the phone was crowned as one of the best phones of 2013. It has gained immense popularity with its 4.7 inch screen, 2 GB RAM and mostly because the phone has an awesome 10 MP camera. However, there are a number of complaints reported by the users that they find their Moto X camera not working. You can easily fix your camera with the solutions given below and enjoy taking beautiful pictures. In most cases, simply clearing the cache can solve the problem. For this you have to go to Settings and tap on All App. There you will find the icon of Camera which you must click and a window will appear. On this window you will see two tabs of Clear Cache and Force Stop. First, click on Force Stop and then clear all the app cache. Once you have done this, you can go to your camera and see it working again. Similarly, updating the camera can also solve the camera issues and improve its quality significantly. Once the camera is updated through Over the Air (OTA) programming, it can automatically adjust the effects and settings and gives you the liberty to use your camera in all possible ways. Sometimes your phone camera does not work because the working of the application is hampered due to some adjustments made by you. These changes are made during the course of mobile usage and can greatly affect the working of your Moto X camera. Therefore, you can fix this issue by resetting your phone to factory reset. For this, go to Settings, navigate to backup and reset and click on Factory Reset. After this your phone will be as good as new and camera issue will be fixed. Rebooting in safe mode and isolating your device from intervention of any third party applications can help you to determine which particular application is causing the problem with your camera. It is thus advisable that after rebooting, start each a epplication singularly and determine where the actual problem lies so that you can fix your camera. This can be done by pressing and holding Power button and then tab and hold the Power off until reboot safe mode appears. Click on Ok and check your camera after reboot. Also clearing the cache partition and restoring your default camera settings can help you to fix the camera issue. Below are the steps of clearing the cache partition. VI. Use the volume down key to navigate and once reaching Wipe Cache Partition, select this option with the power button. Thus your camera issue will now be fixed. Here is a handy tip for all the new users of iPhone or iPad. Those users who want to change their default search engine on Safari. Safari is mostly used by the most of the iOS users. Safari can also let you to search on Google, Bing or Yahoo instantly. The combined search bar of Safari will help you to search throughout the web and there is no need to open the Bing, DuckDuckGo, Google or Yahoo’s website first. You can easily put your query in the search bar and search for anything on the web. Put your query in the combined search bar and the results page will appear. Google is the default search engine. Indeed, Google is the best search engine over the web but still if somebody wants to change the default search engine to something else instead of Google. Tap on the settings icon to open settings. Tap on the very first label that shows Search Engine. You can select any of the search engines from Bing, Google, DuckDuckGo or Yahoo! Close the settings app and close the Safari if it is opened in the background. Restart safari browser and use the combined search bar to search anything. Now you will be directed to the results page of the search engine that you have selected. You can use only the four search engines as your default search engine (Google, DuckDuckGo, Yahoo, Bing). But keep in mind that you can use Safari with any of the search engine simply by typing the URL into the search bar and tap on the share to add a bookmark and can easily save your desired page as a bookmark. DuckDuckGo is an interesting search engine and you can try it if you are conscious about your privacy. It is a new search engine that was launched in 2008. DuckDuckGo emphasizes your privacy and easy to use as well. Power related problems are common issues that can be faced by many Smartphone owners. Here we are giving some tips to you that how you can troubleshoot your Samsung Galaxy S6 plus that is not responding or turning on. Here are some helpful steps for those who want to troubleshoot their Smartphone. The first thing you should need to do is to restart your Smartphone. Firmware plays a major role regarding this problem and you will need to rule the firmware first because if your phone crashed and you don’t know the reason, you cannot fix the problem on your own because you will be unable to charge or turn on the phone. You cannot remove the battery of Samsung Galaxy S6 Edge Plus. So, the simple procedure cannot be applied on it and it is a little complicated now. A new feature has been introduced by the Samsung Engineers; a combination of keys can be used to restart your phone. If you want a force reboot, you have to press and hold the volume down and power button together for at least 20 or 30 seconds or until your phone restarts. This procedure will perform the imitate battery disconnect which in turn is equal to the battery pull. This procedure will fix the phone if the phone was just frozen. If your phone is not responding to the force reboot procedure, then there might be a possibility that the battery was exhausted completely. You should need to plug in the charger and check if the phone is responding. It will help to figure out if there is a problem with the hardware or not. The LED indicator will give you an idea that your phone is detecting the current or not and the usual charging sign will also be displayed on the screen if your phone is responding to the current. If there appears no sign then there is some issue with the phone’s hardware and there is no choice for you except sending your phone for replacement or repair. If your phone is showing the charging sign, then let the phone to be charged for at least 10 minutes before you try to turn it on. If the phone is still not responding, then you should try to boot it up in safe mode. Press the volume down and power button together and hold the both buttons for at least 20 to 30 seconds. Release the power button once the Samsung logo appears on the screen but don’t release the volume down key. Your phone should need to keep on booting up and you will be provoked to unlock the phone. A text “Safe Mode” will be displayed at the lower-left corner of the mobile’s screen if your phone is booted in safe mode. There is a possibility that a third-party has caused some clashes in the system which results in crashing the system. If the safe mode procedure failed then try to boot up your phone in recovery mode and if the phone is booted up in the recovery mode, wipe the cache partition. Press and hold the Volume up, Home key and power button together at the same time. Release the power button once the phone vibrates but don’t release the Volume up and home key. Release the Volume up and home key once the Android System Recovery Screen appears. Use the volume down key for scrolling to ‘Wipe Cache Partition’. Use the power key for selection. ‘Reboot System now’ will be highlighted once the wipe cache partition is completed. Use the power key for restarting your phone. We all have been living in the era of smartphone, but the consistency between different smartphones has always been there. People have been looking for a phone that could give them an edge over others. With the launch of Samsung S6 Edge Plus, people were attracted to the unusual design of the phone. Its’ curved edges and innovative features make it unique in the market. Well, the excellent performance of the mobile phone is worth the price you pay. It has a 4GB built-in RAM, 32 to 64 internal storage and the bigger screen with the rounded corners. It is not something to be missed. You might not know about its’ different modes that can be activated to enjoy the other features of the phone. So, let’s take about the private mode of the phone. Go to the desired album and hold an image, you’ll see a check mark over the image. Go through the list of options. The desired data has been sent to the hidden content folder of the phone. The procedure will be followed for other type of data to be hidden. But after hiding the desired content, images, videos, voice recordings, you are supposed to disable the activated “Private Mode” from settings. But once you are in Private Mode, your phone is secure and you can enjoy your content. The year 2015 saw some of the finest launch of products by Apple Incorporation. People went crazy when the Apple Watch was launched and introduced a whole new ways to operate this tech savvy gadget. We have also witnessed the successful launch of iPhone 6s and 6s plus and have seen how the phones were celebrated having the first 3D Touch technology. We also saw the release of iPad Pro as a first generation product and similarly Apple launched its new TV in the same year. Thus, people are all geared up for 2016 and there is a high speculation over the range of products and its specification which Apple is set to launch in coming months. Among all the Apple products there can be no dispute on considering iPhone 7 as the most anticipated phones of the year 2016. We have already seen how Apple has taken the markets by storm with the introduction of first 3D Touch Technology. Therefore we expect that the company will further build on this feature and capture its market by the launch of iPhone 7. Tech watchers are expecting Apple will take huge leap in department of design. They are predicting that the new phone will remove the 3.5 mm headphone jack and its thickness will be between 6.0mm to 6.5mm. Also there are reports that Apple will improve the camera, incorporate wireless charging and will design a waterproof model. The most important change that is speculated is that iPhone 7 will enlarge its display size by deleting the home button and make it an edge to edge screen. Apple launched a much needed upgrade of its mobile Operating System (OS) in September with release of iOS 9. The new OS was generally well received by the users despite having some minor glitches in the software. Consequently Apple is believed to upgrade its operating system with iOS 10. The upgraded version will possibly have the ability to hide default Apple apps and users will have option to download apps from third party. Similarly there is huge prediction that iOS 10 will have Home app to connect all the Home kit compatible products scattered around your house. After the success of Apple Watch it can be said that the company will be encouraged to launch Apple Watch 2 and its release is speculated in March with iPhone 6c. The new watch will add new features like GPS and the watch will be water resistant, which was overlooked in the older version. We expect that Apple will take the focus on health on a next level and add many more sensors and doodads. Thus it will be great year for the tech savvy people who will be able to get their hands on some of the coolest gadgets and will see a significant improvement of Apple’s range of products. So brace yourself and keep your stakes high as Apple never disappoints its loyal customers. With the launch of iPhone 6, Apple has taken the market by storm. Users of iPhone 6 are highly satisfied with its sleek design and added feature. The phone has build in iOS 8 operating system which can be upgraded to iOS 9. Similarly Dual-Core 1.4 GHz processor makes this phone fastest in comparison to its previous version. However, like any other phone, this phone has few issues that are reported by iPhone 6 users. The most common problem addressed by the users is that their phone does not ring. Although you can report this problem to Apple, but it is wise to check some solutions listed below that might save your visit to Apple store. Often times you are at a meeting or at a conference and you may have turned your phone to mute. The meeting is over but you forgot to switch the mute off and then you wonder why you have missed so many calls. So the first step is to the check if the mute is on. Mute switch is located on the side of your device and if the orange line is visible inside the switch that means mute is on. Before you start to panic about your phone not ringing you must also check whether your phone is on Do Not Disturb mode. For this you must go to settings and click on Do Not Disturb option. If the option is set on Manual, then turn it off and if Schedule is on then you must check the timings. Mostly your phone did not ring because of the timings you set the phone on. Sometimes iPhone 6 does not ring because there has been some problem with the network settings. It is thus advisable to check the ringing of the phone by resetting your network settings. This can be done by going to Settings, then tap on General, tap on Reset and finally click on Reset Network Settings. Another way to solve this issue is to turn off your 4G which might be creating some problems with your phone. To do this you can go to Home screen and click on Settings and navigate to Cellular. There you can click on Enable LTE switch and turn it off. After this your phone might start ringing. This is the last solution which must be followed only if the above methods did not work. Before you reset your phone to Factory Reset make sure to back up your data. For resetting your phone go to Settings, tap on General and choose reset. Find erase all Content and Settings and click on it. You will be asked to choose Erase iPhone or cancel. You must click on the first option and wait for the phone to erase all the data. It might take an hour and the problem will be fixed. Thus the above solutions mostly work but if the problem still persist then it will be best to visit Apple store and show your phone to a technician.